One of the biggest challenges in cancer therapy is being able to sufficiently deliver chemotherapy drugs to tumors without exposing healthy tissues to their toxic effects. 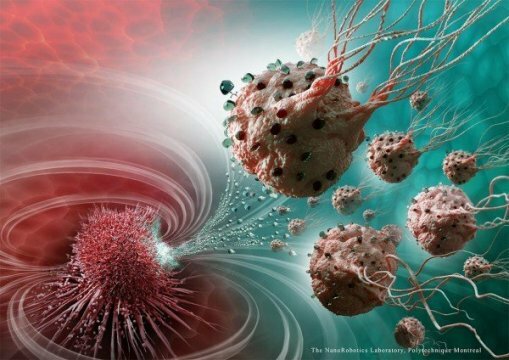 One way researchers have attempted to overcome this is by developing nanocarriers — extremely small particles packed with drugs. The nanocarriers are designed so they're only taken up by cancer cells, thereby preventing the drugs from being absorbed by healthy tissues as they travel through the body's circulation. Yet while nanocarriers do a good job protecting healthy tissues, the amount of drug successfully delivered to tumors remains low. The main reasons for this shortcoming are that nanocarriers rely on the circulation system to carry them to the tumor, so a large percentage are filtered out of the body before ever reaching their destination. In addition, differences in pressure between the tumor and its surrounding tissue prevent nanocarriers from penetrating deep inside the tumor. As a result, nanocarriers aren't able to reach the tumor's hypoxic zones, which are regions of active cell division that are characterized by low oxygen content. "Only a very small proportion of drugs reach the hypoxic zones, which are believed to be the source of metastasis. Therefore, targeting the low-oxygen regions will most likely decrease the rate of metastasis while maximizing the effect of a therapy," says Sylvain Martel, Ph.D., Director of the Polytechnique Montréal NanoRobotics Laboratory and lead researcher of the study. With funding support from NIBIB and others, Martel's research team conducted a series of experiments to show that the bacteria's unique navigation system could be exploited to more efficiently deliver drugs to tumors. "When they get inside the tumor, we switch off the magnetic field and the bacteria automatically rely on the oxygen sensors to seek out the hypoxic areas," says Martel. "We constrain them to the tumor and then let nature do the rest." "This proof-of-concept work shows the potential to tap into the intricate and optimized cell machinery of single celled organisms such as bacteria," said Richard Conroy, Ph.D., director of the Division of Applied Sciences and Technology at NIBIB. "The ability to actively and precisely target drug delivery to a tumor will help reduce side effects and potentially improve the efficacy of treatments." The next step for Martel's team is to determine the effects of the drug-loaded bacterial cells on reducing tumor size. They would also like to test whether the bacteria can be used to deliver other types of cancer-killing medicines such as molecules that instruct the immune system to attack tumors. In addition, the team is working to expand the types of tumors the bacteria could be used for. Currently, the bacteria have to be injected very close to the tumor because, if injected into arteries, the excessive blood flow and the distance needed to travel would impact the number of bacteria that reach the tumor. This limits the drug delivery approach to cancers that are easily accessible such as colorectal, prostate, and potentially breast cancer. However, Martel's team has shown in animals that they can transport the bacteria through arteries and sufficiently close to the tumor by first encapsulating them in magnetic carriers and propelling them by the magnetic field of an MRI scanner. The bacteria can then be released from the carriers, like torpedoes from a submarine, once close to the tumor. This multi-step approach could potentially open the door for using the bacteria to deliver drugs to tumors deeper in the body. "These bacteria are really the perfect machine. They replicate, they're cheap, and we can inject hundreds of millions or more at a time," says Martel. Materials provided by National Institute of Biomedical Imaging and Bioengineering.